Strategic objective: To produce specialized business professionals with a deep understanding of the health industry, its language and unique culture. Ability to apply recent business knowledge, concepts and techniques to healthcare problems and issues. In-depth knowledge of the health industry, the various business functions including management, marketing, finance, accounting and management information system as well as essential medical science. Critical business skills including decision making, problem-solving, leadership, innovation and team building. In-depth understanding of the health industry unique culture and its language. The applicant must have completed a minimum of 12 years of school education. All applicants must complete 17 years of age on or before the 31st December in the year of admission. The applicant must have proficiency in spoken and written English. The applicant must have passed any one of the following English Language Proficiency Tests with a minimum score as applicable, of 1100 EmSAT Achieve (UAE Standardized test in English Language)/ 500 TOEFL (CBT 173 iBT 61)/ IELTS Academic 5.0/ PTE A (36-44)/ Cambridge ESOL (41)/ or equivalent in any other standardized internationally recognized test approved by the Commission for Academic Accreditation (CAA), Ministry of Education – Higher Education Affairs, UAE. The applicants from UAE education system offering General Track/Stream or Abu Dhabi Education Council (Literary /Scientific) criteria must have secured an overall average of 65% or above marks as per UAE Secondary School Education Standards in the 12th Grade. UAE UAE Student should secure an overall minimum score of 65% and above in the 12th Grade. Indian Central Board/ICSE Student should secure an overall minimum score of 45% and above in the 12th Grade. Bangladeshi Board Student should secure an overall minimum score of 45% and above in the 12th Grade. Baccalaureate Student should secure an overall minimum 22 points. USA American Diploma Student should secure an overall minimum score of 65% and above in the 12th Grade. Nigerian WAEC Student should secure an overall minimum score of 45% and above in the 12th Grade. Applicants from any other non-UAE educational systems not listed above must have secured a minimum aggregate score equivalent to UAE 65% or above as per International Grade Conversion Table published by WES. All applicants shall be evaluated for cognitive and non-cognitive traits demonstrating their aptitude for the chosen area of study by the Admissions Committee which include personal interview. Admission is finalized on competitive basis. 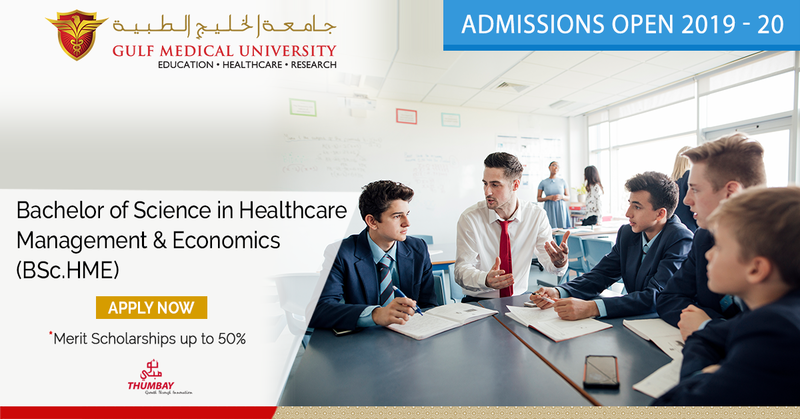 There are many rewarding career opportunities not only in the UAE but also on a regional and global scale for graduates of the BSc.HME as a result of the fast growing healthcare market in the UAE, GCC countries and worldwide, coupled with the acute shortage of specialized healthcare business professionals in hospitals, health authorities, pharmaceutical companies, biomedical startups, government and health organizations, financial sector, banking, medical research centers, health consulting firms, medical device companies, medical tourism as well as in international health organizations. P O Box: 4184, Ajman, U.A.E.